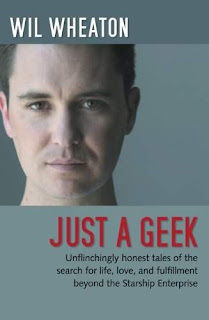 I've had Just a Geek on my reading list for some time now, but I have only really felt my interest in Wil Wheaton flare up more recently after getting back into Geek & Sundry's output again, specifically Critical Role and Tabletop. Since I was mostly familiar with Wheaton's work from around 2012 onwards, I was looking forward to reading about his work from before then. Just a Geek is a collection of essays centred around entries that Wil Wheaton made on his personal blog wilwheaton.net, focusing on the entries between the website's inception in 2001 and the book's publication in 2004. In these essays, he focuses mainly on his struggles as an actor famous enough to be too recognisable for throwaway commercials but no longer famous enough to pull in huge crowds, as well as his complicated love-hate relationship with Star Trek and the community surrounding it. "The realisation that each random passerby is living a life as vivid and complex as your own - populated with their own ambitions, friends, routines, worries and inherited craziness - an epic story that continues invisibly around you like an anthill sprawling deep underground, with elaborate passageways to thousands of other lives that you'll never know existed, in which you might only appear once, as an extra sipping coffee in the background, as a blur of traffic passing on the highway, as a lighted window at dusk." While it mainly applies to random people who may cross your path only once, I do think it has more general applications. With Wheaton, it was something of a shock to hear him talking about just how depressing it could get with regards to wasted career opportunities, auditions that went to flavour-of-the-moment actors, and the difficulties balancing work and family life, because while he does come across as a lot more genuine than a lot of actors, you do get the realisation that there is a lot more under the surface than perhaps you want to acknowledge when watching something silly and fun like Tabletop. And maybe you get to see the shape of how his life continued, to the point where the 2010s come along and he seems to be in a much better place, though still looking enviably baby-faced. I guess what I'm trying to say is that I appreciated just how much Wheaton admits to his audience here. It's a brave thing to do, especially for someone so inextricably linked to the near-universally disliked Wesley Crusher.